Home Topics Readiness & Mindsets What Happens When Principals and District Administrators Sit in the Student’s Chair? This post was originally published on MIND Research Institutes’s blog. Earlier this year, pioneers in education, neuroscience, math and public policy gathered for a very different kind of professional development event. The Deeper Learning Symposium: Empowering Your Math Superheroes welcomed participants to get hands-on and experience math with all of their senses. The main topic of discussion: innovating and changing math education. Most of the brain is devoted to building the circuitry responsible for the things we know automatically, says Dr. Peterson, like how we answer the question, “What color is grass?” Green. Right. The brain builds this kind of automatic knowledge through a continual cycle of perceiving or detecting something, taking an action and then experiencing the immediate effects of that action: the perception-action cycle. The brain consolidates this knowledge into interconnected webs of understanding called schemas. In math, it takes time to form these foundational schemas through repetition and mastery. 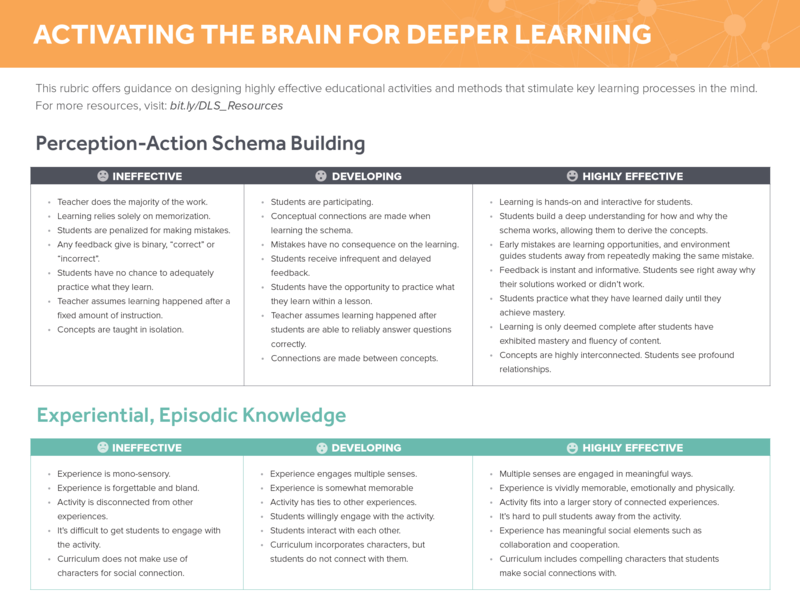 Once formed, these schemas provide a powerful framework of knowledge that allows students to go deeper and think critically and creatively around a topic. In contrast to perception-action schema building, which requires repetition and time, there’s a kind of learning that happens instantaneously. “One experience and you’ll remember it for the rest of your life,” says Dr. Peterson. It occurs in the lower part of the brain and no surprise that this is that kind of knowledge that results from an experience that’s vividly memorable, both emotionally and physically—stories with compelling characters, field trips, traveling. In learning, these are the activities you can’t pull students away from. These highly engaging experiences present powerful learning opportunities. The front part of the brain uses the experiential knowledge and perception-action schemas that we’ve built to think over space and time, to perform multistep problem solving, to be creative and ideate. Here students are moving beyond repetition and automaticity of mathematical facts into applying those facts in new and novel situations, and even across academic subject areas. “You don’t really understand something until you’ve had to explain and justify your reasoning,” says Dr. Peterson. 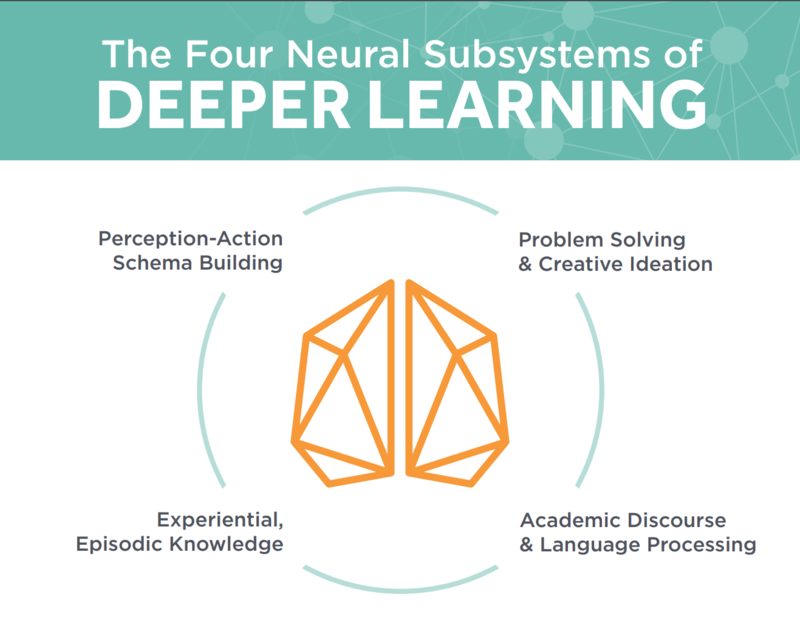 Our language subsystems, occurring in various sections of the brain, rely on all the other learning subsystems. We draw upon our schemas of understanding, we draw upon our experiential knowledge. We use our prefrontal cortex to be creative and problem solve when we’re trying to put our ideas into words. Heera Kang is Manager of Engagement Content and Design at MIND Research Institute. Follow them on Twitter at: @MIND_Research.